It was the depression era. The year was 1932. Sheldon Sampson, a wealthy businessman, had dreams of being called to an island where he would find answers and help for his country, the United States. But this island is mysterious, as no one has ever heard of it or seen it. It appears only in Sheldon’s dreams. After traveling a great distance, he found and hired a crew to take him to this land of the unknown. Sheldon’s brother, Walter, and some of his friends from college left for their journey, not knowing what was in store for them. All they had to go by was a picture of the island that Sheldon drew for them. The crew reached the mountainous island, but no one outside the group knows what happened while they were there. They never even talked about it amongst themselves. The only thing that is known is that they returned home as superheroes. Costumes and all. The story jumps to the present. The children of the now aging superheroes have super powers, but most of them do not take their responsibilities of being a superhero seriously. The aging superheroes are still out in the field fighting villains while most of their children are living life in the fast lane. Sheldon’s children are partygoers and drug users. His arrogant son, Brandon, takes care of superhero groupies in the mens’ rooms at clubs. His sister, Chloe, is a drug abuser and uses the renowned name of her family to gain publicity, fame and endorsements. Soaking up the spotlight while doing nothing to earn it. They’re both slackers. They don’t care about saving the country. They just want to live carefree. Walter’s son, Jules, is a slacker also. When a fight erupts between the heroes and a villain, Jules stayed back. His plan was to jump in at the end and throw a few blows. He is also using the family name for his own personal fame. The economy is weak and the two brothers, Sheldon and Walter, engage in a verbal dispute over their roles as public servants. Walter feels it’s his moral responsibility to show the president what needs to be done to stabilize the economy. Sheldon, on the other hand, wants to continue fighting crime, as he feels that politics are to be left to the politicians. 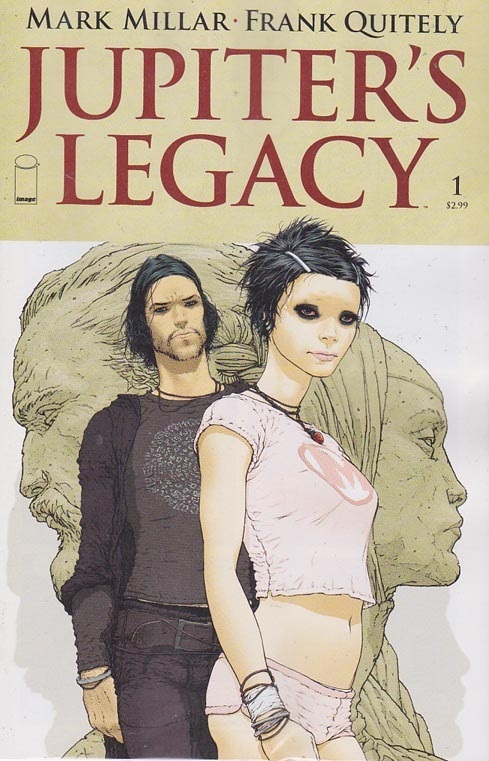 Jupiter’s Legacy #1, a new by Image Comics, is a story about a generation gap and the problems in-between this gap. Children of renowned superheroes who has no desire to follow in their parents footsteps. I went into this title with no idea of what it was about, therefore I didn’t know what to expect. Although the script is well-written by Mark Millar, the story didn’t grab my attention at all. There was no substance for me to get hooked on. Younger readers may find this story boring and hard to follow. Sure you have the younger generation running around partying, abusing drugs and feeding off their parents names, but you also have their parents, older heroes who believe in serving their country and being responsible. They care about the economy, their country and the people in it. Younger readers may not care too much about the latter. I like the artwork. Frank Quitely (artist), and Peter Doherty (colors). I like how the appearance and style of the kids’ costumes immensely contrasts with that of the more classic style of costumes worn by the older heroes. I was bored stiff by this debut issue. I only found one page turner. And I couldn’t turn it because it was the last page. As of now I’m up in the air as to whether I will give the next issue a try or not. I do not recommend this title.